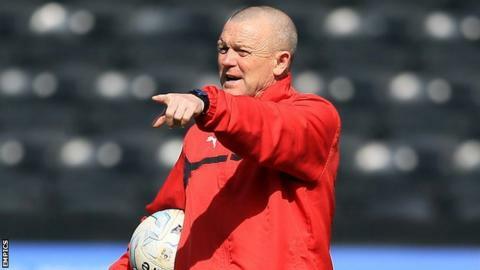 Kidderminster Harriers chief executive Colin Gordon says he expects head coach Dave Hockaday to stay with the struggling National League club. In an interview published by The Sun last week, 58-year-old Hockaday said he would "crawl over broken glass" to return to Leeds United, following a short spell as head coach in 2014. But Gordon dismissed the ensuing social media furore as unfortunate timing. "He's under agreement to be here until the end of the season," said Gordon. Kidderminster are bottom at the halfway stage of the National League season and 10 points adrift of safety, having won just twice in 23 matches. Their four games over the festive period are all against top-four sides. They go to fourth-placed Eastleigh and second-placed Forest Green, Hockaday's former club, before two games against leaders Cheltenham Town (at home on Boxing Day, then at Whaddon Road on 2 January). "That's what we expect him to do. It was an interview that had been done probably a few weeks previously and, combined with Saturday's result (Harriers lost 2-1 to Stourbridge to exit the FA Trophy), that made it a perfect storm," Gordon told BBC Hereford & Worcester. "Mr Cellino (Leeds United owner Massimo Cellino) can do whatever he wants and invariably he does, but I've known Dave Hockaday for 30 years and I'm sure he's got a more favourable working relationship with me. "He's head coach. Deal with it. You still have to turn up do the best you can for the group of players and hope it's enough to win football matches. "We're all working hard to resolve the position we're in. Barring Stourbridge in the FA Cup (when Harriers lost 3-0 in November), no team has battered us. What people need to see is signs of improvement." Harriers go to Eastleigh on Saturday in the first of a tough programme of four successive matches against sides currently in the National League's top four. Gordon was speaking to BBC Hereford & Worcester's Dan Wheeler. "I would crawl over broken glass to go back there. I don't have the ego to be a head coach so, if the president called and said 'coach the Under-21s or be an assistant,' I'd love it. "They will at some stage become a Premier League club again. That city is so hungry for success. I hope the president turns it around and finds a way to sort the club. He's needed a bit more help and advice from people which he hasn't had. He's tried to take too much on. "I still talk to the president and have the utmost respect for what he does. I don't have any gripes with him. He gave me a great opportunity. I'm just disappointed I did not have more of an impact but he could have given me some better players to work with. "The players that were brought in were not as good as the president thought he was bringing in though. He over-estimated the quality of Serie B and under-estimated the quality of the Championship. "The president wanted a good English coach and someone out of work to give him leverage. It gave me less power but I never for one second felt out of my depth. I was allowed to put forward the names of players we wanted to sign. Eight now are doing very well in the Championship."